UBC’s School of Architecture and Landscape Architecture, in partnership with ORO Editions, is set to launch the next in their series of books capturing the essence of the place and the people behind some of our regions most significant and celebrated examples of West Coast Modern architecture. 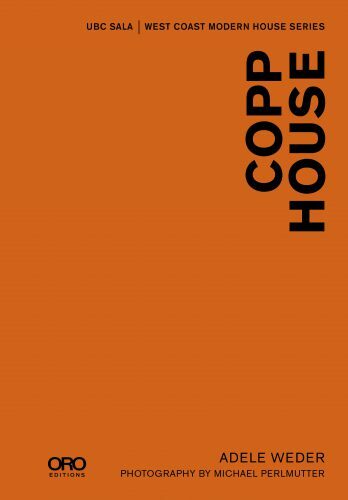 “Copp House,” by the League’s own Adele Weder, reflects on a landmark of West Coast Modernism by the then young apprentice Ron Thom. Other titles in the series include “House Shumiatcher” by Leslie Van Duzer, “Downs House II” by Chris MacDonald, “Merrick House” by Tony Robins, “Binning House” by Matthew Soules, and “Freidman House” by Richard Cavell. Each book is an opportunity to engage more intimately with a uniquely-designed architectural icon, the great Canadian architect who designed it, and the architectural movement that has come to so heavily influence the traditions, values and principles of our design community and city building efforts.